Alright, I know the title of this post is harsh and I'm sorry. Harsh, I know, has a tendency to hurt people's feelings and I don't really care to do that unnecessarily. Books can be very personal things that we identify with closely and I've discovered a fair number of people who really take it to heart when you say that you do not care for a particular book that they themselves love. Such may prove to be the case with the following two titles but, ultimately I have to confess that I just didn't care for them, for various reasons. 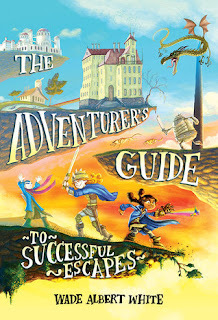 I've mentioned that this year I'm involved in a little project which requires that I spent a lot of time reading Middle Grade fiction released in 2016. This should help to explain the increase of this genre being featured around these parts. Bear with! Both of following titles are due to be released here shortly and I received both for review purposes. In the case of The Bicycle Spy, I have to say that I really wanted to love it. Written by Yona Zeldis McDonough, this book is set in France during World War II. 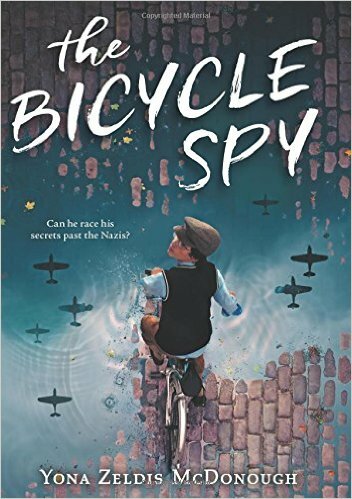 It tells the story of young Marcel who dreams of one day riding in the Tour de France. At the time the book opens though, we meet him making deliveries of bread from his parent's bakery on his bicycle. It doesn't take too long for him to become suspicous as to why his parents are having him deliver so much bread and he rather quickly discovers that his parents are part of the French Resistance. Quicker still, he confesses to his parents that he knows what they are up to and he becomes involved in their plans and movements. I like what McDonough is trying to do this book. She is hoping to share with her young readers a brief history of World War II and what life looked like in a French household during the German occupation. This is all well and good, but as an adult reader I found the tale less than convincing. Her writing style just flat out didn't appeal to me. The only way I know to describe it is to say that it was "simple", lacking artistry. I found Marcel's activities unbelievable and his internal thought processes too mature for the age of his character. He just didn't work for me and so I found the majority of the story a bit eye-rolling, I am sorry to say. Again, I love the idea for the story but it felt too stilted somehow and lacking in depth. I know it seems rude to say thank you to Scholastic Books for sending a copy of The Bicycle Spy my direction but I am grateful for the opportunity to read it, even if I didn't particularly care for. I wish to assure the general public that I received no additional compensation for this review and that all of my opinions are 100% my very own. Secondly, I was sent a copy of The Adventurer's Guide to Successful Escapes by Wade Albert White. Let me say that I find the cover art incredibly attractive and the title quite intriguing. I was very excited to launch into this one . . . and was very quickly disappointed by it. This book tells the story of young Anne, an orphan who lives under a cruel and terrible guardian at a home for "Perpetually Wicked and Hideously Unattractive Children." The day before her thirteenth birthday she is rescued from her life situation and accepted into a school by a Wizard counsel. (Wait. Wait. Where have I heard this idea before?) I got about 100 pages into the story before I couldn't take it anymore, whereupon I skimmed a few chapters in the middle and read the final two to discover this is the first story in a series of books. This bit of info should strike fear into your very hearts and minds. "Sorry I dragged you into all of this," said Anne suddenly, "I thought we were heading off to a wonderful adventure, not getting dropped into the middle of a horrible one." "Are you kidding me?" said Penelope. "This is the best thing that's ever happened to us. I mean, yeah, okay, so whacking my head on the drawbridge hurt a lot, and the zombie sharks and the iron knights were all kinds of terrifying, and I was unconscious for part of the time, and research is boring and makes me sleepy, and I thought we were finished for sure when those suits of armor attacked us and then that rope bridge broke. And of course, the thought of falling off these steps in our sleep is scary beyond belief, and who knows what we're going to find at the top of this tower, and sure, if we fail miserably, we'll spend our formative years stuck in a dungeon somewhere. But, you know, other than that, I'm having the time of my life." Maybe someone else out there would revel in passages like this (on every page) but I couldn't. I was in all out forehead smacking territory by the time I read about the cat named Her Royal Highness Princess Fluffington Whiskers of the Mousetrapper Clan. I'm going to take a pass on this one for sure and you won't find a recommendation for it in me. If you think you can stomach it though, be my guest! This is a horrible point in the review process to say "thanks" to L-B Kids for sending a copy my direction. I'm sure this wasn't the type of review that they were hoping for. Everyone should rest at ease in knowing that I did not receive any additional compensation for writing this and the opinions expressed are 250% my very own. I invite you to second and third opinions! In the words of LaVar Burton, "You don't have to take my word for it!" Boy, this is a Monday post if ever there were one, isn't it? Sorry. Moving on then . . . I'm not into middle grade fiction in general. I can sort of understand the humor of the second one in maybe one character or scene or section, but through the whole thing would be a bit much.